If you've ever felt frustrated with meal planning strategies that don't work, you're going to love this method! My strategy allows for loads of flexibility and the freedom to choose each meal based on how busy your day is, or the tastes you're craving. 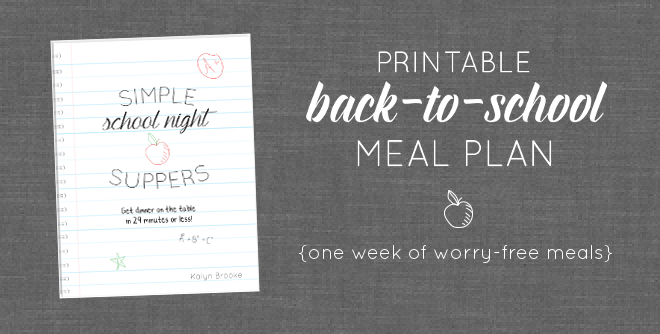 Includes a FREE meal planning printable! My detail loving brain loves the concept of meal planning, but not the boxed-in, rigid feeling that often goes along with it. You know what I mean, right? Every single printable or meal plan known to man woman Pinterest coordinates certain meals with certain days. And don't even get me started on once-a-month meal planning. Our crazy schedules don't allow the luxury of knowing exactly what we're going to eat so far in advance! I honestly wondered why I was so incapable of planning a week full of meals, that is, until I realized how much I had been overthinking this entire thing. The solution was ridiculously simple! If you're tired of feeling tied to a specific meal plan, you're going to love this concept. And if you're new to meal planning in general, this post will give you the perfect introduction! Whenever it's time to meal plan, usually every Sunday afternoon or evening, I pull out a max of 3-4 cookbooks, plus my iPad to browse all the recipes I've saved Pinterest. 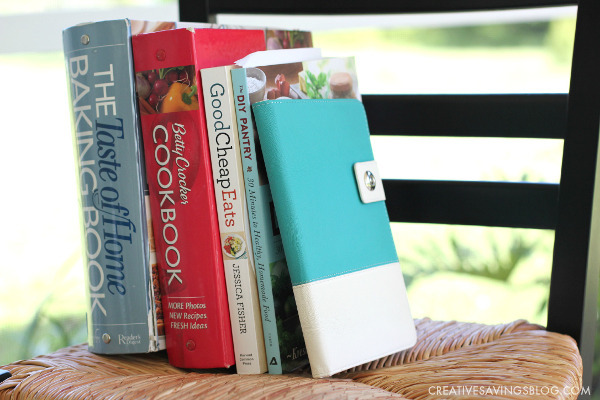 I tend to vary my plan based on what I feel like making, but the cookbooks below are some of my go-to picks. I actually explain more about them in my post 5 Cookbooks that Help Save Money in the Kitchen. 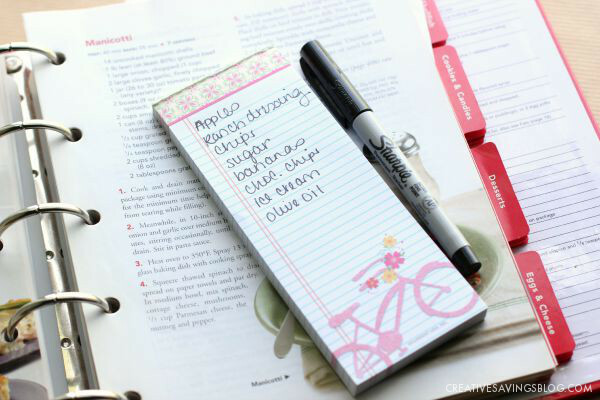 My next step is to write down 3-4 recipes that are standard favorites, then one new recipe to try for the week. I love trying out new foods, but they often take much longer to prepare because I'm not used to the recipe yet. So I try to limit those as much as possible. I also make sure one or two of the meals are quick and simple ones — like pancakes or pizza — in case we have a day that is too hectic for a complicated meal. Once I've established the main meals, I go through the cookbooks again, and add sides to the ones that need it. Note: If the meal is from a cookbook you don't normally use, write down the name of the book and the page number. I've spent precious time looking for a recipe before with no idea where to find it! Every time I write down a meal plan, I skim over the ingredients and do a quick check of the pantry and fridge to make sure I have everything. Then I write down exactly what I need from the store. If it matches up with the sales that week, great! If not, I don't sweat it. The only time I meal plan around what's on sale, is when we buy produce. I check to see what fruits and veggies are in season, then incorporate them into my sides and snacks as needed. Having your entire list of ingredients ahead of time means no more guessing, and no more running to the store last minute because you missed an essential component of the recipe. Although, that still happens to me from time to time — I'm just super thankful we have a Publix 5 minutes away! You might have noticed that I don't assign a day to each meal at all. Leaving this sort of wiggle room allows me the freedom to choose a meal based on the sort of day we're having, or tastes we're craving. And it's most definitely not set in stone. I used to always use scrap pieces of paper to write down my meals, but I finally got my act together and asked Michelle from Elegance and Enchantment if she would help create my dream meal plan on paper. She said YES, and now I have a pretty printable that functions exactly the way I need it too! You can download the printable for personal use below. It includes 5 dinner ideas, as well as spaces for sides, lunch, breakfast, and snacks. It even comes with a handy grocery list for ingredients! Andrea from AndreaDekker.com meal plans by theme, and each night has it's own type of meal – Monday — Italian, Tuesday — Breakfast, etc. Mostly Homemade Mom goes completely paperless and uses Pinterest to meal plan. Laura from Organizing Junkie has a weekly Menu Plan Monday, where you can link up your meal plan as an accountability. If you'd rather meal plan by day, download Elegance and Enchantments Meal Planner. 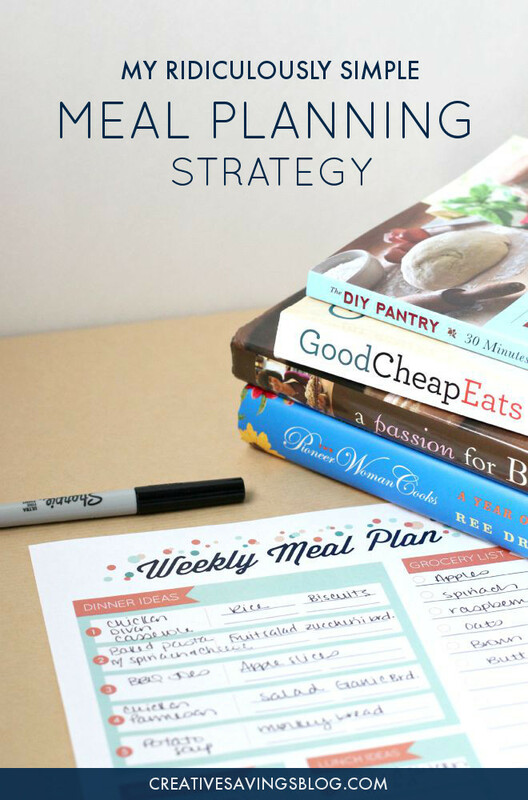 For loads of meal planning tips, visit Good Cheap Eats for her Menu Planning 101 series. And lastly, if you are constantly stumped at what meals to make each week, eMeals has some really great plans that match up amazing recipes with local store sales. I highly recommend it! Even if meal planning hasn't worked for you before, I strongly encourage you to try it again. It's not only a life saver by answering that dreaded question of what's for dinner, it also helps stretch your grocery budget too — you'll eliminate excess food waste AND avoid takeout! What Meal Planning Strategies Work for You? Don't let the stress of a new school year ruin important family time. These easy weeknight dinners come together FAST, and are loved by everyone! My menu planning is worked out in a very similar way. I like the way you’ve listed out the process, and the helpful links you shared. I’m going to have to go searching for the Dorito Taco Casserole recipe! I’m hoping to post the Dorito Cassarole recipe on the blog soon. It’s not very healthy, but it’s one of my husband’s favorites. Thanks for visiting! And planning breakfasts is something I’d like to explore further. We always rely on cold cereal, and I’d like us to eat a little healthier. Working on experimenting with some oatmeal recipes that both of us will eat! I do something similar. I use a cheap calendar from the dollar section of Target. I plan out a week or two at a time. I have a binder of favorite recipes and my recipes to try Pinterest board. Once I try a new recipe it either goes to my favorites or didn’t like it board. I like being able to see what I made a few months ago and it helps me when I can’t think of what to make! The freezer is my friend, for more than just bread and rolls. I like to cook enough for several batches of main courses that freeze well, then freeze each batch – well packaged and marked with the name of the dish and the date it was frozen. It takes basically the same amount of time to make a big batch as it would to make a smaller one. That way, if we have a night when all I can do is defrost, we can still have a substantial meal. I do a weekly meal plan on a cheap dollar isle tear pad. I do one big meal, one soup/chili/curry, a quick family favorite and 2 freezer meals per week. By the end of the week half the stuff is crossed off or arrowed to another night because they day got too busy. I like this list approach! This method is what I use as well and I completely relate to what you said about having over thought the process for a very long time before coming to the conclusion you did. I love knowing that I have the ingredients on hand for X amount of meals and then choosing from that list each day. When I’m down to that last meal; even if it doesn’t sound good, it keeps or family from ordering takeout and saves so much money! This was really helpful! For some odd reason I have been in a meal planning slump lately. We’ve been eating out way too much so I needed something to help me get back on track! I love your meal planning sheet, I think it’s fun and creative. Thanks for sharing! You’re welcome, Jenn! I know those slumps all too well. Getting one of these sheets filled out and attached to my refrigerator always helps get me back on track – I hope it helps you as well! I got a mini 5.5 by 8.5 Avery brand binder from the store today! I also got some section dividers for it and I am going to use it for meal planning! 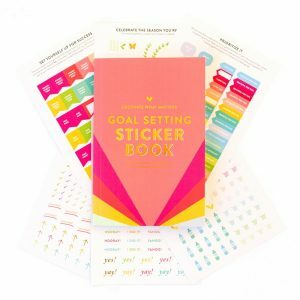 Your printable will go with it so well! Thank you so much! Your welcome, Taurren! Have fun getting your meal plan organized! This is the method I use too. Keeps us from getting burned out on the same meals. You mentioned you don’t plan around what is on sale except for produce but this is easily incorporated by just looking at your local ads right before you start browsing recipes! I have a double sided magnetic dart board that my son no longer wanted in his room, it has been repurposed to holding my menu plan for the week. I print our favorite recipes on 3×5 cards and use pretty magnetics to hold them. It’s a plain black background for the cards and I’m not stuck with days of the week which made me feel trapped when I didn’t prepare a meal planned. Now when I make a meal during the week I just take down the cooresponding card. I usually shop once a month, so my grocery list is pretty much the same every month. We are not very adventurous when it comes to trying new recipes. We like what we like and stick with the same meals only changing our side dishes with seasonal fruits and vegetables. I’ve really enjoyed reading your posts. I’ve learned a lot and pinned so many to read more later. Thank you! Your meal planning board sounds amazing! I love that you are able to easily re-arrange meals since it’s magnetic. I’d love to see a picture of it! I’m sorry Dana, I’m having some issues with my email provider. I’ll email it to you now! for some reason it hasnt appeared in my inbox and ive checked quite a few times does it take a few hours ? Have you gotten it? If not – please email [email protected] and we’ll take care of you! I’m having trouble getting the menu printables. Can you email them to me? Our email forms seem to have hit a bit of a hiccup today. You should have an email from Joseph with your menu printables! So very sorry for the delay. Thanks for making me aware of the issue.